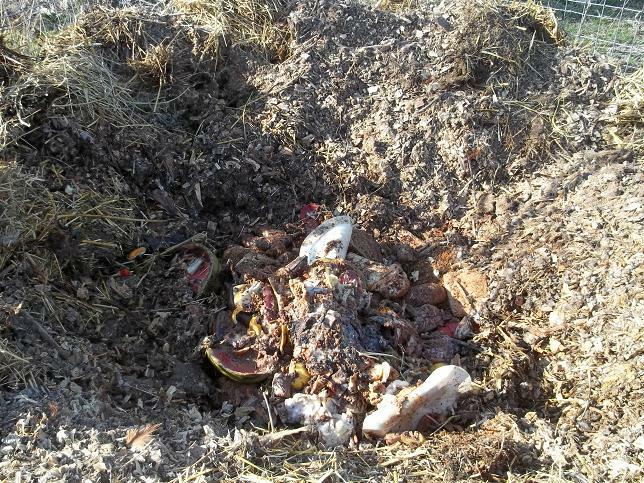 Our primary compost pile is a little long in the tooth and totally stuffed. I had to build a new pile to handle the winter bedding for goats and chickens. I began with a 5 foot ring of fencing, 4 feet tall. 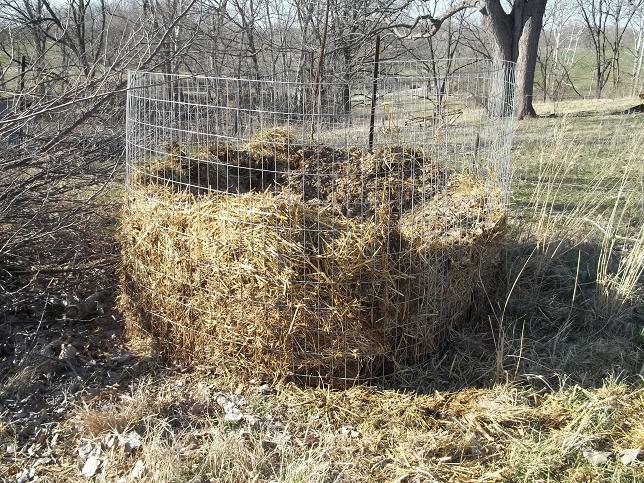 I piled used bedding into it but any carbon will do: straw, leaves, etc. I left the center open to give me a pocket for smelly organic wastes. In this case, four 5-gallon buckets of kitchen scrap. This can be anything that will rot from watermelon rinds to coffee grounds and filters to paper plates. Finally, I added a good layer of carbon to the top to keep the odors in and the flies down. Remember, if you can smell it you need to add carbon! People often add a layer of wire mesh to the top to keep animals from digging into it. I’m not too concerned with this pile but when I add chicken offal I will protect it from our wildlife. 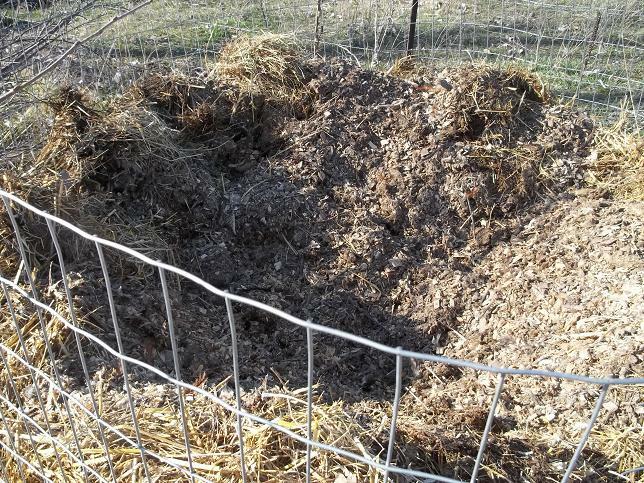 So there you have my 5′ diameter, 4′ tall overflow compost pile. I should note that while it is dry I leave the top dished out to capture as much rainfall as possible into the dry pile. Once it gets nicely soaked I’ll probably change that. 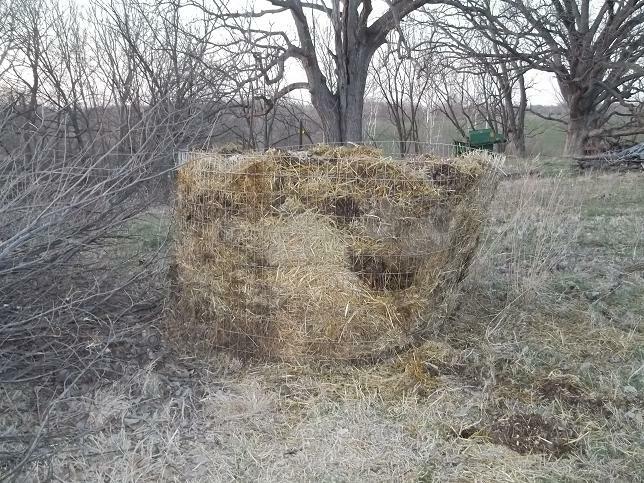 If this pile still exists in July I expect it will steam even on the hottest days but it should be fertilizer by then.